A few months back, it was vital that NYSUT be revived. Oddly, this coincided with then-President Richard Iannuzzi taking steps and speaking out against the reforminess that pervaded the state. But they came out with a lot of bold promises, the only one they've been able to keep was likely leaving the Fort Orange club. But I have no doubt they're pretty cozy anyway. If you think they're traveling around sleeping in their cars or staying at Motel 6, you've got another thing coming. Thus far, their most significant legislative victory has been passing a bill to make sure they get two pensions. What have they done for us? Well, they helped delay Common Core-related junk science scores to be used against teachers. So you have another year or so before you can be fired for that particular strain of junk science. 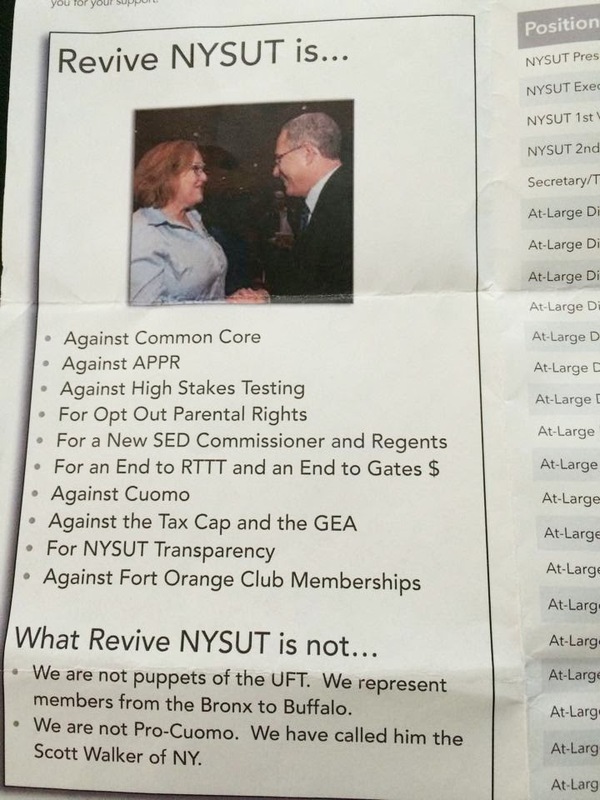 But Karen Magee, while not quite offering to punch us in the face and push us in the dirt a la Mulgrew, pretty much told the AFT that that the only alternative to Common Core was utter chaos, directly contradicting the pictured pamphlet. And personally, I'm weary of the nonsensical talk from union leaders about divorcing the Core from testing, particularly since we just supported a bond that will provide billions for computer equipment to give the tests we supposedly oppose. And Cuomo, who we failed to oppose at every step, who we in fact supported at the useless and preposterously named Working Family Party, is now making noise about doubling down on APPR. If you think Magee, Pallotta, or any of the Revive crew opposed APPR in the least when Iannuzzi and Mulgrew negotiated it, I have a bridge in Brooklyn with your name on it. In a brilliant and creative use of our member dues, NYSUT sent out a voter election guide that I received yesterday, three days after the election was over. In Revive's defense, some of my Facebook friends report having received it as early as Wednesday. They do things like this and wonder why we got trashed on Election Day last Tuesday. Of course it isn't their fault, because nothing ever is. As for the small things, I bought a car last spring. The salesman offered to sell me insurance. Of course, having MetLife via NYSUT, I knew I had a good deal. After all, we must get a discount or something, what with 600,000 potential paying customers. I thought, oh my gosh, he already sold me a car and he's still not satisfied. But my wife said, no, let's listen. She dragged me into the insurance guy's office, where we were offered the very same coverage we had with MetLife via Allstate for almost a 50% reduction. When I canceled MetLife, they didn't even ask me why, let alone try to dissuade me. Apparently Revive NYSUT, who traveled all over the state promising to go over everything with a fine-tooth comb, has not bothered to look at quality-of-life things that affect us lowly members. Of course this was my fault too, for assuming they'd bother to negotiate anything worthwhile for us. I certainly won't make that mistake again. They have priorities, like their double pensions. They barely wasted a moment making sure that none of them would have to go through what they're putting former Secretary-Treasurer Lee Cutler through. You won't see a Revive member kicked off the gravy train without recourse anytime soon. And I don't doubt for a moment the double pension deal was negotiated before any of the younger Revive members agreed to run. You don't think they'd risk being treated the way they treat Lee Cutler, do you? As for the rest of us, MetLife is happily advertising its overpriced coverage on Facebook this week. Apparently they enjoy profiting from their cozy relationship with NYSUT. And evidently Revive NYSUT leadership is either unaware, doesn't give a damn how overpriced this coverage may be, or both. It continues breaking promises, being utterly ineffectual, failing to take and follow up on substantive stands, and painting a smiley face on deals that benefit leadership and do nothing whatsoever for those of us who still do the actual work of helping New York's children.